Gov. John Baldacci’s proposed biennial budget, which cuts $73 million out of General Purpose Aid to schools, also calls for other changes, including reductions in the tuition private schools can charge public districts this year and the amount of aid going to communities whose high property values make them minimum receivers. While the Department of Education says the reduction in aid to minimum receivers and the tuition proposals are designed to spread the pain of the GPA cuts, other provisions would allow closer monitoring of how districts spend the money they get. There is a proposal, for example, to make annual school district audits more stringent regarding cost-center transfers and another to require that minor capital projects be included in the regular school budget. Above all, the proposed state budget language makes it clear just how much of the burden of paying for K-12 education is going to shift onto local property taxpayers as state GPA declines. Under state law, each community must cover its local share of the cost of education, as defined by the Essential Programs and Service funding formula, and raise up to the required equalized local mill rate to cover those costs. With the proposed cuts in GPA, that required local mill rate for education is going from 6.37 to 6.69 in this fiscal year and up to an estimated 7.14 next year. 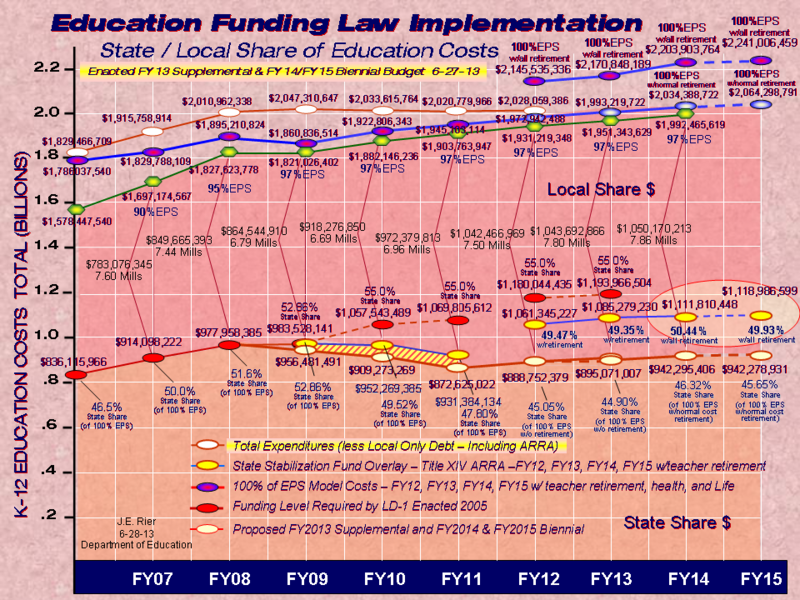 Put another way, the local share for K-12 education this year will be $918 million versus a state share of $921 million, plus $43 million in federal stimulus money. Next year, the local share will be $997 versus a state share of $852, plus $59 million in federal money. That means the state share of education will drop to 44 percent in school year 2010-2011, with locals picking up 52 percent and federal stimulus money covering the rest – federal money that runs out on June 30, 2011. The required local-share numbers don’t include what districts spend for programs not covered by the EPS formula. The sticker shock on the required local share will be made worse in those communities where property valuations have increased more than the state average, since the state gives less to those with higher values. Ultimately the budget will have to be approved by the full Legislature. n Cut GPA for the current school year by $38 million and next year by $35 million on top of substantial reductions in GPA for 2010-2011 already included in the regular biennial budget. That means total state aid and federal stimulus money going to schools this year will be $964 million and $911 million in 2010-2011.
n Waive, for this school year only, the requirement that locals make up for what the state is cutting in terms of required spending under EPS. That means communities won’t have to raise their mill rates, but districts will have to make difficult cuts in the middle of the school year to keep their budgets balanced. n Reduce state aid to the more than 80 minimum receivers who receive a portion of their special education expenditures in lieu of a percentage of their overall EPS allocation. They will go to 40 percent of the unit’s special education costs in the current school year and to 30 percent in 2010-2011 and succeeding years. n For those few minimum receivers who currently get 5 percent of their EPS allocation, versus special education reimbursement, that will be reduced to 4 percent in the current year and 3 percent in 2010-2011 and succeeding years. n Cut private school tuition rates for the current year by 2 percent to give a break to those districts that tuition out their high school students and therefore have to absorb this year’s budget cuts in their K-8 system. n Cap future tuition rate hikes for both public and private schools at the rate of inflation versus the previous limit of up to a 6 percent increase. n Require the annual school district audit to look at whether districts transferred more than 5 percent among costs centers – 5 percent being the limit in statute. If districts have exceeded the 5 percent limit, they have to file a corrective action plan with the commissioner of education. 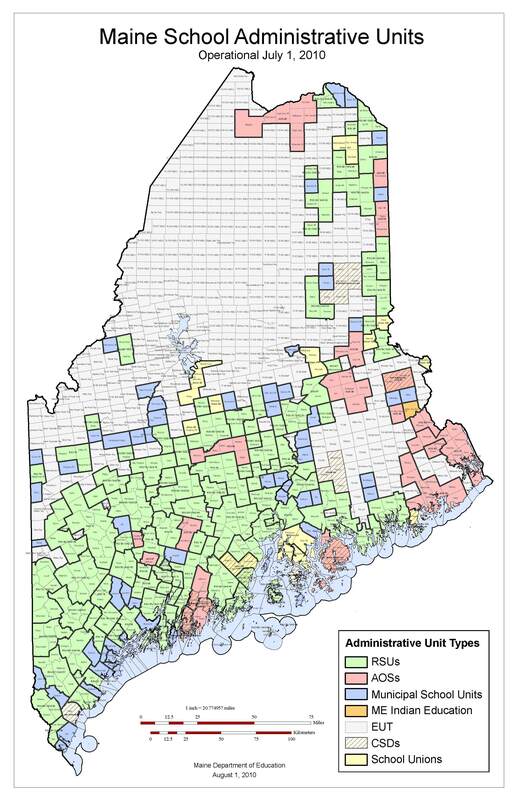 n Change statute to say school administrative units can no longer include minor capital projects on the warrant along with non-state-funded major capital school construction projects. They instead will be included as part of the general school budget. n Repeal sections of the law dealing with budget articles and require SADs and CSDs to have the same 11 cost centers as RSUs.